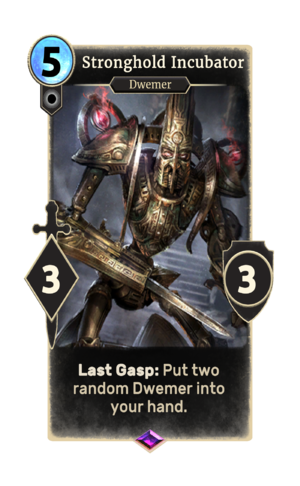 Last Gasp: Put two random Dwemer into your hand. Stronghold Incubator is an epic Neutral creature card. It is part of the Core Set. This card was previously part of the training mechanic where it could be upgraded from Stronghold Prototype at level 44. The card's art depicts a Dwarven Sphere. This page was last modified on 14 February 2019, at 11:47.